Extracorporal membrane oxygenation (ECMO) is a rapidly advancing form of mechanical circulatory support. ECMO was first used in 1971 by Dr. Robert Bartlett in the neonatal population for meconium aspiration. The evolution of the technology in terms of pumps and oxygenation membranes has allowed for the adoption of this technology in the adult critical care community. ECMO is divided into two types of support. VA-ECMO (venoarterial) support consists of draining blood from the right side of the circulation, usually from the femoral vein, and passing the blood through a membrane oxygenator, then returning the blood to the arterial side of the circulation usually via the femoral artery. This can also be done via central cannulation from the right atrium to the ascending aorta. VA-ECMO provides full support for the cardio-pulmonary system. 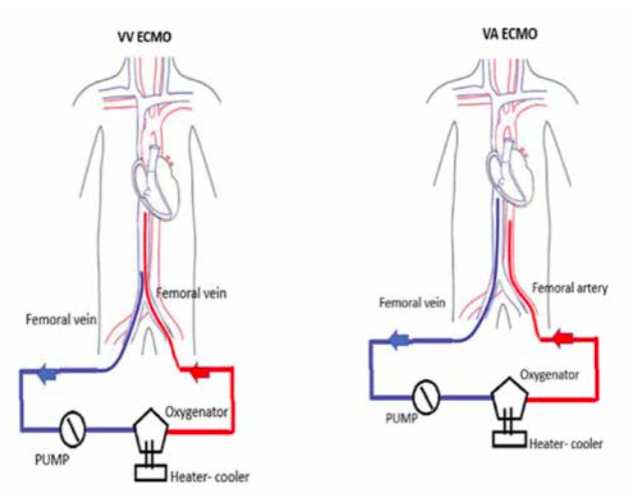 VV-ECMO (veno-venous) support involves draining blood from the ve-nous circulation, oxygenating it and returning the blood to the venous side of the circulation. VV-ECMO is used when there is isolated respiratory failure. This form of support depends on normal cardiac function. Indication for VA-ECMO support include but are not limited to cardiogenic shock, septic shock where more than two vasopressors are required, massive pulmonary embolism, acute myocarditis, stunned myocardium post cardiopulmonary bypass and primary graft failure post-orthotopic heart transplant, among other causes. Most often, cannulation is performed at the bedside or in the cath lab. The procedure is performed via the percutaneous approach using the Seldinger technique. Cannulation does require an initial bolus of heparin, so active GI bleeding or recent neuro-surgery or recent stroke are contraindications for the procedure. Once the patient is on VA-ECMO support, we move rapidly to wean all vasopressors and inotropic support usually within a 4-6 hour window, but this is where an experienced team is important. We work for rapid extubation and early ambulation of these patients. In our experience at Piedmont Atlanta Hospital, which includes 434 patients since 2009, an average time of sup-port is between 7-14 days for myocardial recovery. De-cannulation is generally performed at the bedside, but depending on circumstances may involve going to the operating room for open cut down and direct surgical repair. VV-ECMO support involves the same percutaneous cannulation approach but does not involve arterial cannulation. Once we have established adequate oxygenation and carbon dioxide removal, we again work toward rapid ex-tubation if clinical circumstances allow. In our experience, the most common indications for VV-ECMO support are Acute Respiratory Distress Syndrome (ARDS), community-acquired pneumonia (CAP), pulmonary embolism with in-tact cardiac function, near drowning and gastric aspiration. The time to recovery is longer in VV-ECMO support. We have maintained support up to 67 days, and centers across the country have gone out to several hundred days with lung recovery. If we cannot obtain early extubation, we move to early tracheostomy. The main contraindication to VV-EC-MO support is an irreversible pulmonary process, for example idiopathic pulmonary fibrosis. Our experienced team of pulmonary physicians and critical care physicians work closely together to make the determination of suitability for VV-ECMO. The Extracorporeal Life Support Organization (ELSO) maintains the largest database on volumes, outcomes and quality for ECMO support in the world. The volume, outcomes and quality of the ECMO program at Piedmont Atlanta Hospital has earned it a Gold designation from ELSO. The most recent data from 2016 bear this out. ECMO is a rapidly advancing form of mechanical circulatory support that is used for either cardiopulmonary sup-port or respiratory support. It has a steep learning curve, therefore the benefits of an experienced team of ECMO specialists is invaluable in obtaining excellent quality outcomes.